This summer, refresh and relax at the Divani Apollon Palace & Thalasso and Divani Caravel, whose spectacular pools are set to become your ultimate private retreat! With their cosmopolitan atmosphere and highest levels of service, Divani Collection Hotels is proud to offer this season’s ultimate city experience. One of the top hotels in Attica, Divani Apollon Palace & Thalasso offers refreshing coastal breezes, perfect for when the city’s temperature start to rise. Just 25 minutes from downtown Athens and located in the heart of the Athenian Riviera, Divani Apollon Palace & Thalasso is an idyllic oasis! 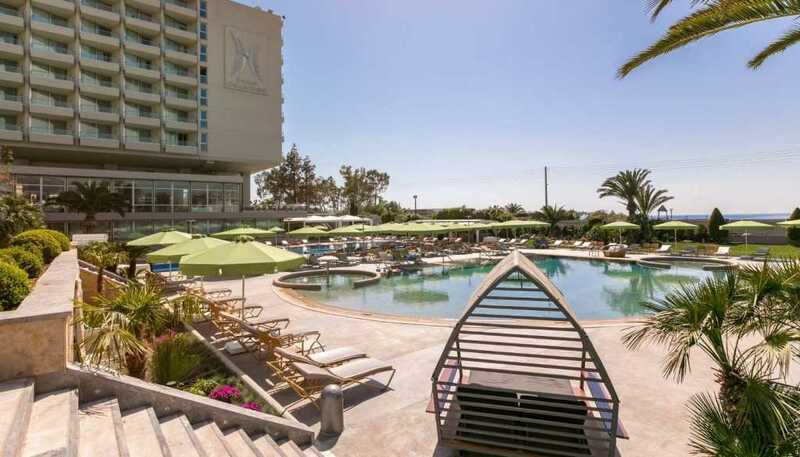 The hotel’s two spectacular pools, which offer both fresh and salt water plus Jacuzzi features, is the city’s ultimate summer getaway, attracting guests both local and international throughout the summer. After the hotel’s recent renovation program, the refurbished swimming pools will spirit visitors away to an exotic island, with the grand palm trees swaying gently in the sea breeze and offering ample shade to escape the midday sun. Guests can rest their gaze on the glittering blue waters of the Saronic Gulf, just a few steps away, whilst enjoying the ambiance of this peaceful, green environment, only a short drive away from central Athens. 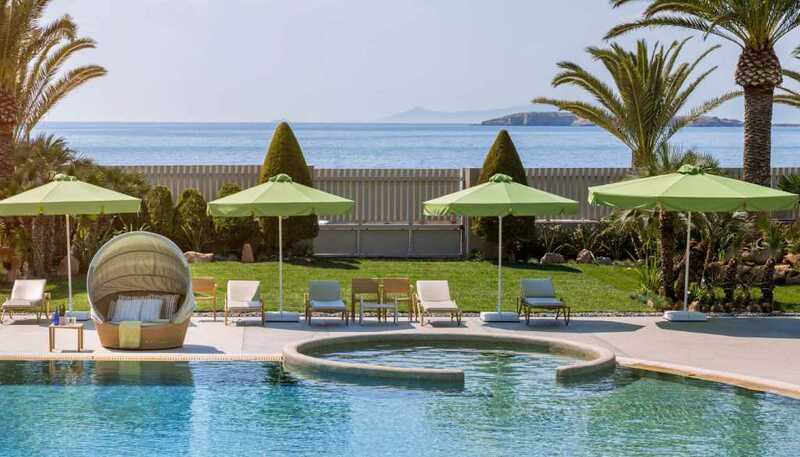 As a member of the Leading Hotels of the World, Divani Apollon Palace & Thalasso’s cosmopolitan character is found in every element of your visit, from its unparalleled levels of hospitality and the crystal clear waters of the hotel pools to the tasty menu of the Meltemi Poolside Snack Bar. 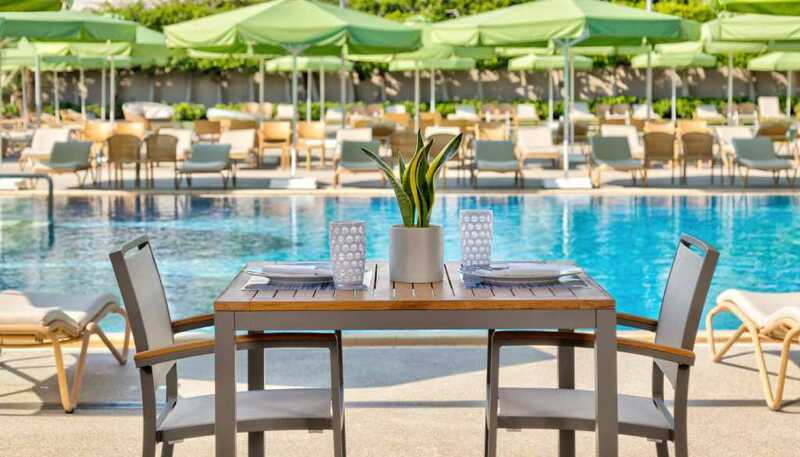 Revive yourself with fresh juices and smoothies, enjoy delicious snacks or order a light meal, providing the ideal nourishment for a day by the pool. Lay back and relax in comfort and style, relishing the experience that has just begun. 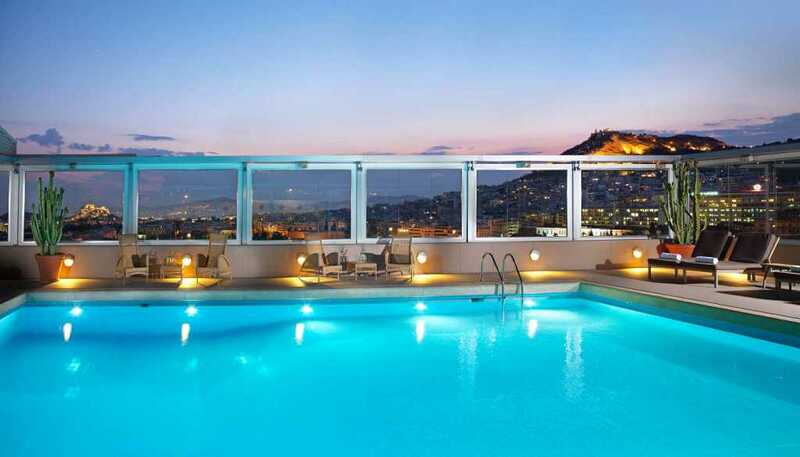 With stunning views of the Acropolis and Lycabettus hill, the roof garden pool of the Divani Caravel hotel is the ideal escape from daily life, offering a true retreat into the special, exclusive world of luxury living. Each and every poolside design feature has been carefully selected to conjure the feeling of being on vacation, just minutes from the bustling city center. With its sophisticated, urban environment, impeccable service, poolside menu of specially crafted light dishes and relaxed atmosphere, every detail of the rooftop pool at the Divani Caravel combines to create a unique and idyllic experience of discreet luxury under the warm Greek sun. Prices: Mon-Fri €40 / person, Sat-Sun €50 / person (incl. use of sun-beds and umbrellas). Prices: Mon-Fri €30 / person, Sat-Sun €40 / person. Divani Collection Hotels is comprised of seven hotels in Greece (four in Athens, plus Meteora, Larissa and Corfu) and has had a strong and successful presence in the Greek hospitality industry for 60 years. Divani Collection Hotels was founded in 1958, in the early stages of the Greek tourism and hotel industry. With values and ideals that spring from a genuine love of hospitality, as well as for catering to the unique needs of each and every guest, the Divani Collection Hotels has been proven to be a leader in its field. Its innovative ideas continue to influence the wider tourism sector in Greece, with its high level of service across all departments, unique character and family atmosphere, setting unparalleled standards in the luxury hospitality industry across the country.